I know, I know, I haven’t been posting enough lately but I am working full time hours lately and my day off was spent Christmas shopping so I’ve barely had chance to just sit down and take a minute to breathe! I’m all ready for Christmas now though. My day off yesterday was spent running round the shops like a headless chicken to get all the presents I had left on my shopping list. I must have done some serious shopping as I managed to pull a muscle in my arm and my stomach, so I’ve felt a bit like a cripple all day at work today! It was worth it though, as everything is now wrapped and ready to go. I love finishing my shopping at Christmas. It feels like such a big weight off my shoulders! Anyway, I know I missed this last week, so I’ve made an effort to sit down for a little while and get this done while I remember. I really enjoy doing these styling posts so I’m trying really hard to keep it up! This week, for something a little different, I’ve decided to do a Christmas Day themed post. I know a lot of people who spend the day in their pjs, and I don’t blame them. Personally though, I like to dress up a bit as Christmas is a pretty big occasion in my family. I’ve created two looks, one for a day at home with the family, and another that could be worn if you were to go out for Christmas dinner. I’ll be staying at home this year as its my mum’s turn to cook, but I’ll no doubt be dressing up to the nines! For Christmas at home, comfort is key for me. In past years I’ve worn skyscraper heels that I got as presents as I couldn’t wait to wear them, but my feet always end up hurting and to be honest there isn’t much point, so I’ll be going for flats this year, or my trusty Allegras. 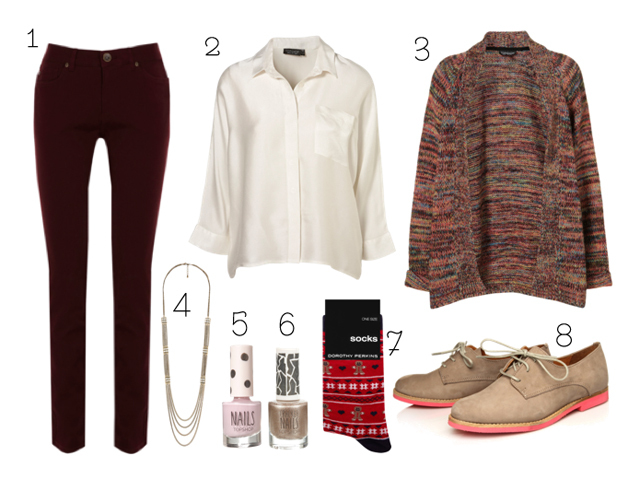 These burgundy skinny jeans are that little bit different and worn with a silky loose fit blouse will look gorgeous. I’d then throw on a chunky knit cardigan to keep me cosy and slip on some oh so festive Christmas socks with some cute brogues. At home I wouldn’t overdo accessories. Just a long layered necklace would be enough. For a dressier Christmas Day outfit, I’d typically wear a pretty floral dress, but jazz it up with jewellery such as a statement chunky necklace and a gorgeous bracelet. I’d wear a leather jacket or maybe even a blazer if I was to go somewhere smart (I never do go anywhere smart, lol.) I’d black opaque tights and some shoes boots also in black, and carry a satchel style cross body bag too. I only ever spend Christmas day at family’s houses, so this is the kind of thing I would wear if I was going to my brothers or sisters for the day. When we’re having Christmas day at home like this year, I’d wear something more casual like the first look! What are you planning on wearing for Christmas? Do you like to dress up for the occasion? I love the casual outfit, all of it is definitely something I would wear, I don't know why I don't own some burgundy jeans yet 🙁 I adore the boots in the formal outfit too, I really want a pair like them! Love that leather jacket! No idea what I'm going to wear! Something sparkly I think. I love that first outfit, the jeans are such a gorgeous colour. I must admit though, I always seem to spend the day in my pyjamas!